How quickly time passes. It was like only yesterday we turned 2016 and now we're already in the 2nd quarter of the year. Anyways, I'm taking a break from the bench so that I can blog for a bit as I have some exciting news to share. First off, my interview with an art and design blog from Germany just came live, so I cannot wait to share it here. I've been lucky enough to be in several interviews but never one from Germany. I'm delighted to say the least and really honored that the owner of the site, Cirsten Dieckmann, wrote to me. The site is call ArtMercato and HERE is where you can find the interview. The first part is in German but there is also the original English transcript below. Please do pay a visit if you have the time! A very interesting site indeed! 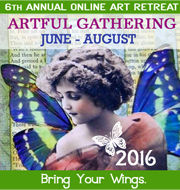 Next exciting news brings me to the online workshop that I'll be teaching at Artful Gathering Online Art Retreat. Registration opens on May 1st, so for those of you who are interested in taking art classes but cannot make it to physical venues, this summer online retreat is a great place to be. This year I will be teaching a Mixed Media Book Making class call "The Looking Glass". My class is in session ONE which will run 6 weeks from 6 June to 17 July 2016. I am so excited about this class and I cannot wait to see you all there. You can visit HERE. Every year I try to think of something different to introduce the workshop that I'll be teaching at the Artful Gathering over summer. This year I made a short video using a technique that really excited me when I first saw it. This video was made using a simple form of Projection Mapping and I totally love how it turned out!